In this two-part post, we are exploring the creation of a GKE cluster, replete with the latest version of Istio, often referred to as IoK (Istio on Kubernetes). 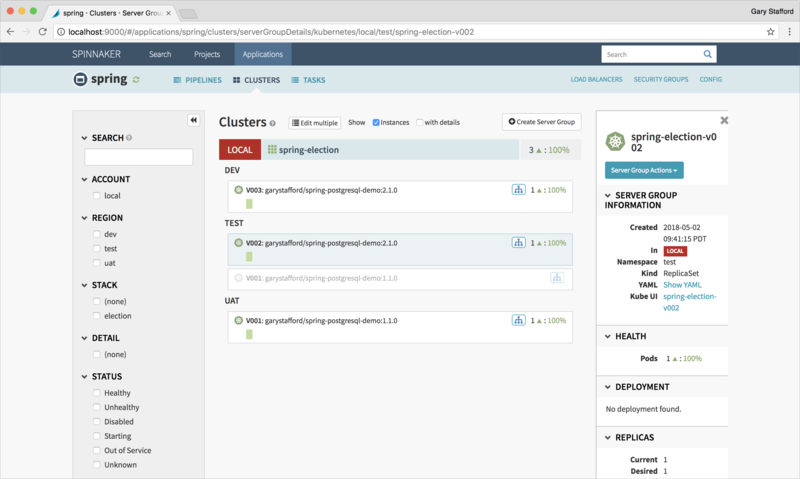 We will then deploy, perform integration testing, and promote an application across multiple environments within the cluster. 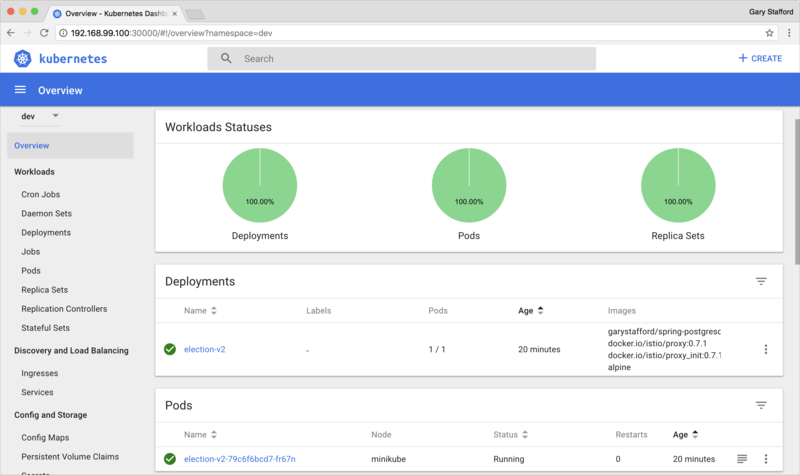 In Part One of this post, we created a Kubernetes cluster on the Google Cloud Platform, installed Istio, provisioned a PostgreSQL database, and configured DNS for routing. Under the assumption that v1 of the Election microservice had already been released to Production, we deployed v1 to each of the three namespaces. 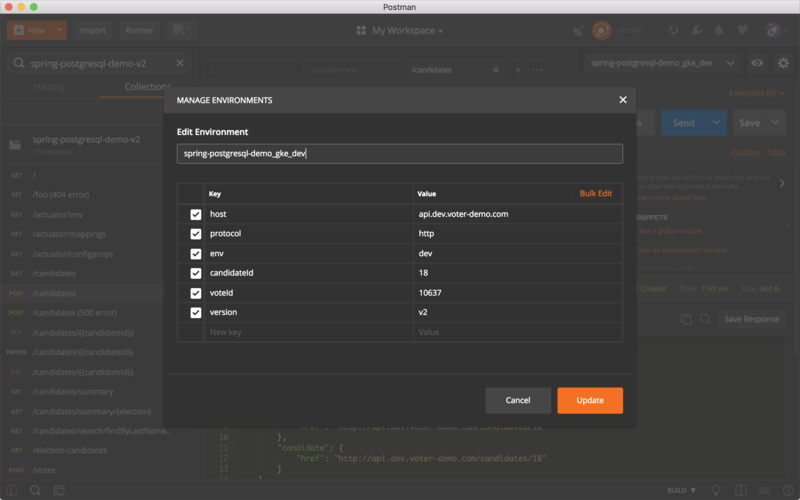 In Part Two of this post, we will learn how to utilize the advanced API testing capabilities of Postman and Newman to ensure v2 is ready for UAT and release to Production. 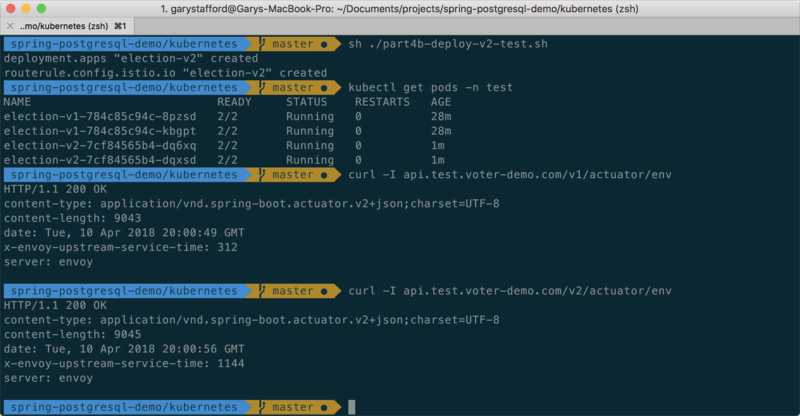 We will deploy and perform integration testing of a new v2 of the Election microservice, locally on Kubernetes Minikube. Once confident v2 is functioning as intended, we will promote and test v2 across the dev, test, and uat namespaces. As a reminder, all source code for this post can be found on GitHub. The project’s README file contains a list of the Election microservice’s endpoints. To get started quickly, use one of the two following options (gist). This project includes a kubernetes sub-directory, containing all the Kubernetes resource files and scripts necessary to recreate the example shown in the post. 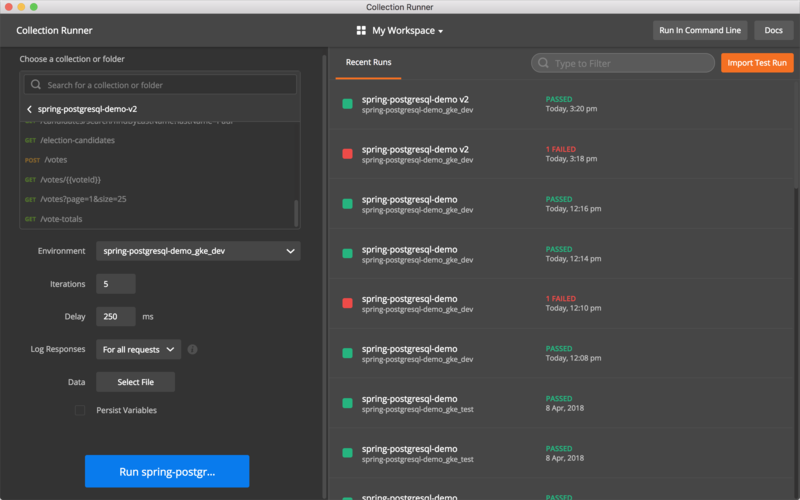 Minikube gives us the ability to quickly iterate and test an application, as well as the Kubernetes and Istio resources required for its operation, before promoting to GKE. These resources include Kubernetes Namespaces, Secrets, Deployments, Services, Route Rules, and Istio Ingresses. Since Minikube is just that, a miniature version of our GKE cluster, we should be able to have a nearly one-to-one parity between the Kubernetes resources we apply locally and those applied to GKE. This post assumes you have the latest version of Minikube installed, and are familiar with its operation. 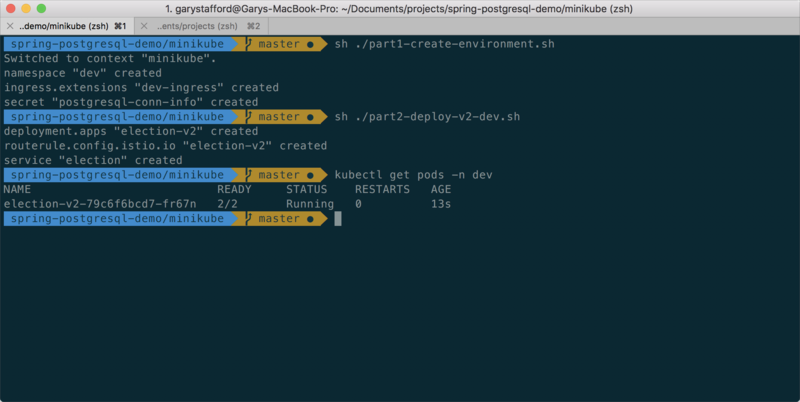 This project includes a minikube sub-directory, containing all the Kubernetes resource files and scripts necessary to recreate the Minikube deployment example shown in this post. 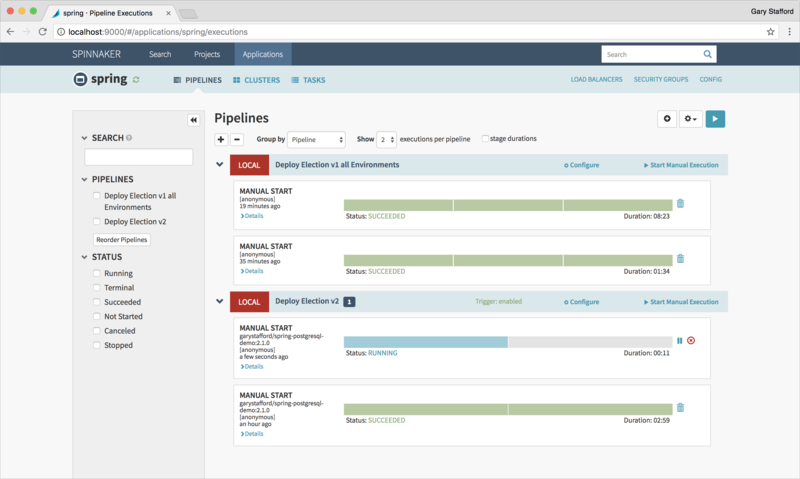 The three included scripts are designed to be easily adapted to a CI/CD DevOps workflow. You may need to modify the scripts to match your environment’s configuration. Note this Minikube-deployed version of the Election service relies on the external Amazon RDS database instance. To eliminate the AWS costs, I have included a second, alternate version of the Minikube Kubernetes resource files, minikube_db_local This version deploys a single containerized PostgreSQL database instance to Minikube, as opposed to relying on the external Amazon RDS instance. Be aware, the database does not have persistent storage or an Istio sidecar proxy. 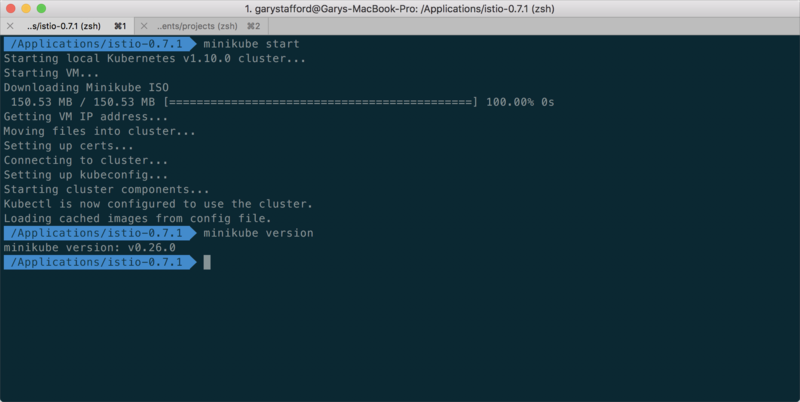 If you do not have a running Minikube cluster, create one with the minikube start command. 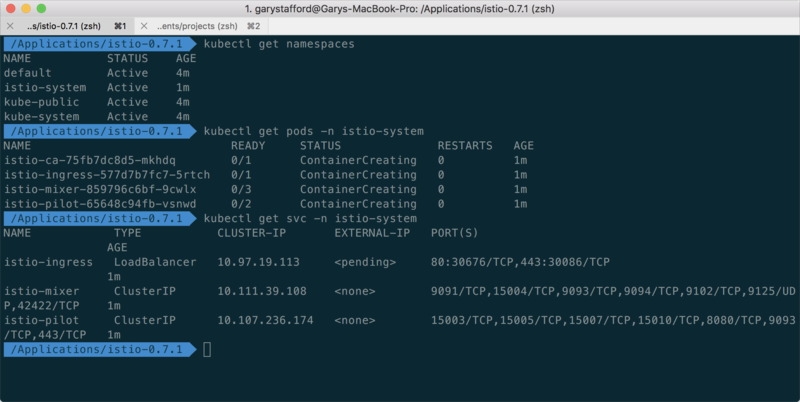 Minikube allows you to use normal kubectl CLI commands to interact with the Minikube cluster. 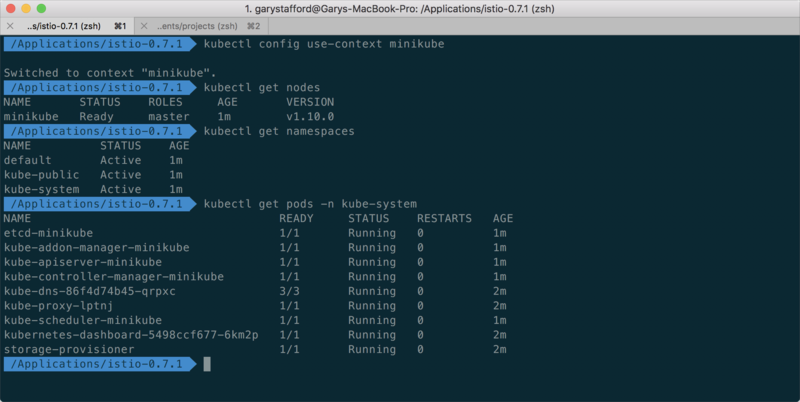 Using the kubectl get nodes command, we should see a single Minikube node running the latest Kubernetes v1.10.0. Next, install Istio following Istio’s online installation instructions. 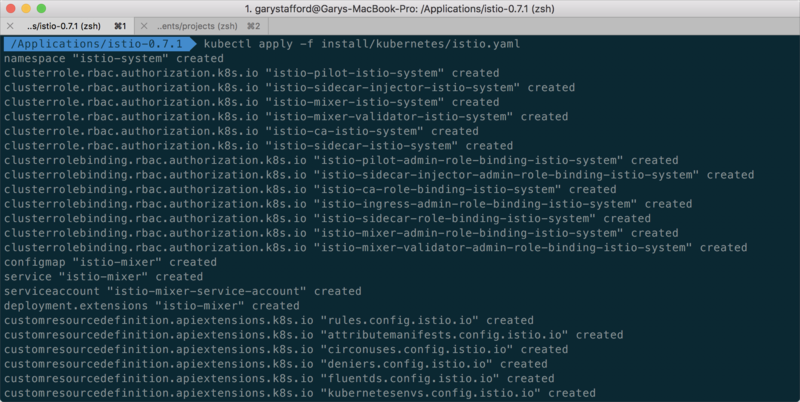 A basic Istio installation on Minikube, without the additional add-ons, should only require a single Istio install script. If successful, you should observe a new istio-system namespace, containing the four main Istio components: istio-ca, istio-ingress, istio-mixer, and istio-pilot. Next, create a Minikube Development environment, consisting of a dev Namespace, Istio Ingress, and Secret, using the part1-create-environment.sh script. Next, deploy v2 of the Election service to thedev Namespace, along with an associated Route Rule, using the part2-deploy-v2.sh script. One v2 instance should be sufficient to satisfy the testing requirements. Access to v2 of the Election service on Minikube is a bit different than with GKE. When routing external HTTP requests, there is no load balancer, no external public IP address, and no public DNS or subdomains. To access the single instance of v2 running on Minikube, we use the local IP address of the Minikube cluster, obtained with the minikube ip command. The access port required is the Node Port (nodePort) of the istio-ingress Service. The command is shown below (gist) and included in the part3-smoke-test.sh script. The second part of our HTTP request routing is the same as with GKE, relying on an Istio Route Rules. The /v2/ sub-collection resource in the HTTP request URL is rewritten and routed to the v2 election Pod by the Route Rule. To confirm v2 of the Election service is running and addressable, curl the /v2/actuator/health endpoint. Spring Actuator’s /health endpoint is frequently used at the end of a CI/CD server’s deployment pipeline to confirm success. The Spring Boot application can take a few minutes to fully start up and be responsive to requests, depending on the speed of your local machine. 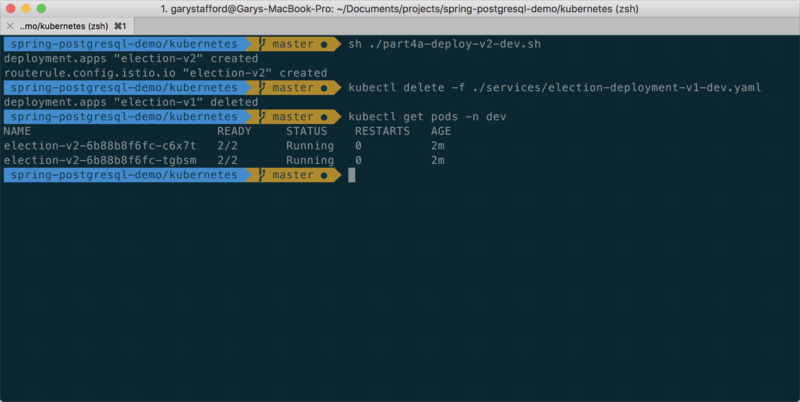 Using the Kubernetes Dashboard, we should see our deployment of the single Election service Pod is running successfully in Minikube’s dev namespace. Once deployed, we run a battery of integration tests to confirm that the new v2 functionality is working as intended before deploying to GKE. 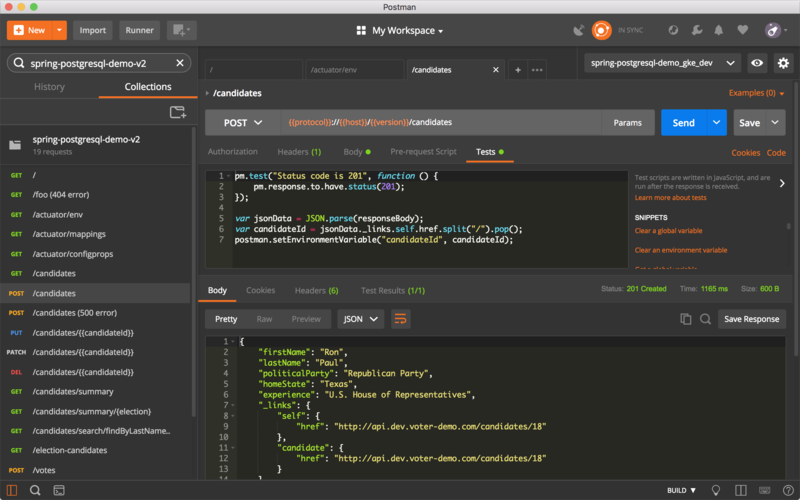 In the next section of this post, we will explore the process creating and managing Postman Collections and Postman Environments, and how to automate those Collections of tests with Newman and Jenkins. The typical reason an application is deployed to lower environments, prior to Production, is to perform application testing. Although definitions vary across organizations, testing commonly includes some or all of the following types: Integration Testing, Functional Testing, System Testing, Stress or Load Testing, Performance Testing, Security Testing, Usability Testing, Acceptance Testing, Regression Testing, Alpha and Beta Testing, and End-to-End Testing. Test teams may also refer to other testing forms, such as Whitebox (Glassbox), Blackbox Testing, Smoke, Validation, or Sanity Testing, and Happy Path Testing. In this post, we are concerned that our integrated modules are functioning cohesively, primarily the Election service, Amazon RDS database, DNS, Istio Ingress, Route Rules, and the Istio sidecar Proxy. Unlike Unit Testing and Static Code Analysis (SCA), which is done pre-deployment, integration testing requires an application to be deployed and running in an environment. I have chosen Postman, along with Newman, to execute a Collection of integration tests before promoting to the next environment. The integration tests confirm the deployed application’s name and version. The integration tests then perform a series of HTTP GET, POST, PUT, PATCH, and DELETE actions against the service’s resources. The integration tests verify a successful HTTP response code is returned, based on the type of request made. Environment-specific variables, such as the resource host, port, and environment sub-collection resource, are abstracted and stored as key/value pairs within Postman Environments, and called through variables in the request URL and within the tests. Thus, the same Postman Collection of tests may be run against multiple environments using different Postman Environments. Postman Runner allows us to run multiple iterations of our Collection. We also have the option to build in delays between tests. Lastly, Postman Runner can load external JSON and CSV formatted test data, which is beyond the scope of this post. 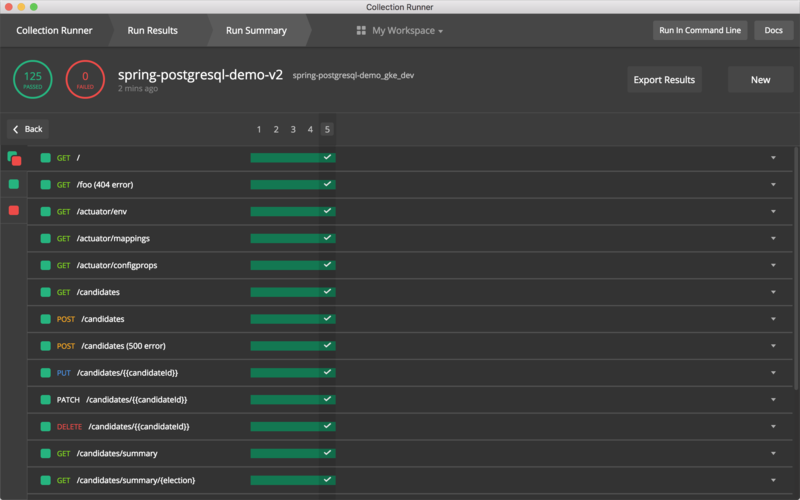 Postman contains a simple Run Summary UI for viewing test results. 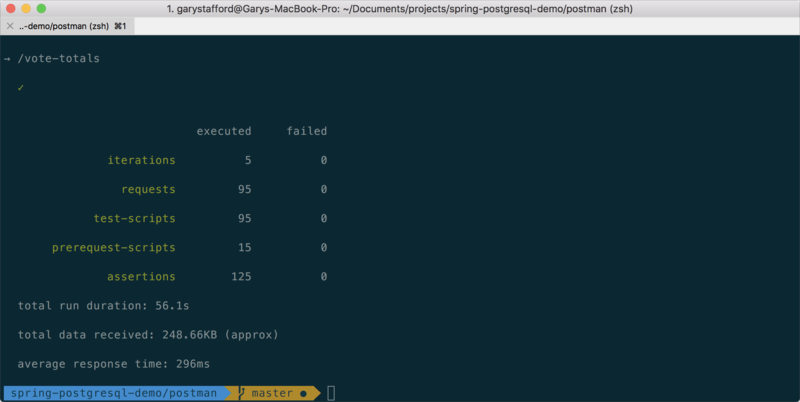 To support running tests from the command line, Postman provides Newman. According to Postman, Newman is a command-line collection runner for Postman. Newman offers the same functionality as Postman’s Collection Runner, all part of the newman CLI. Newman is Node.js module, installed globally as an npm package, npm install newman --global. Typically, Development and Testing teams compose Postman Collections and define Postman Environments, locally. 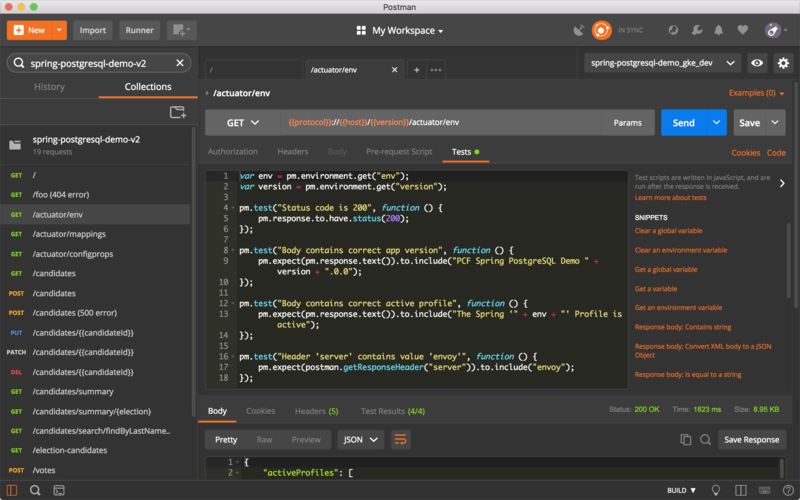 Teams run their tests locally in Postman, during their development cycle. 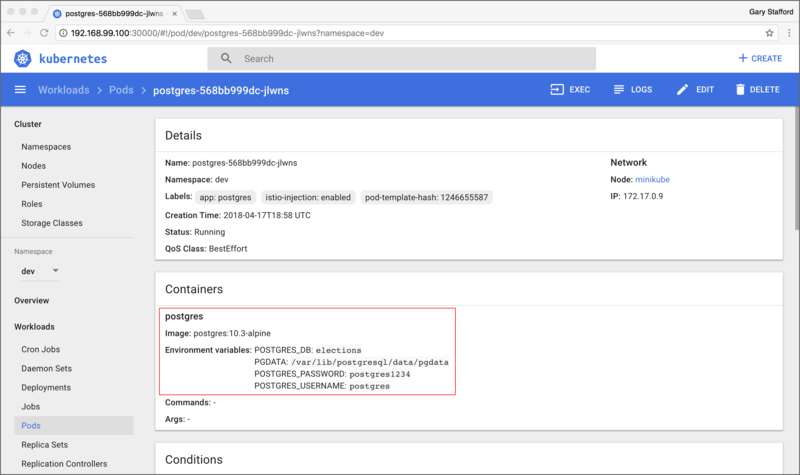 Then, those same Postman Collections are executed from the command line, or more commonly as part of a CI/CD pipeline, such as with Jenkins. 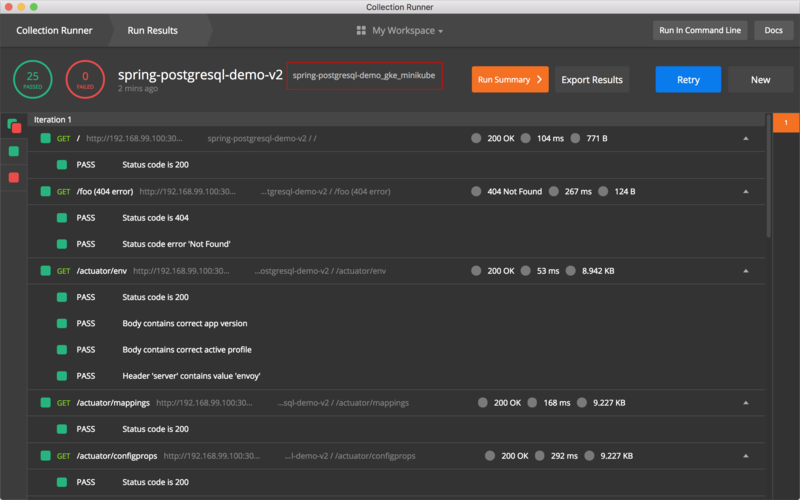 Below, the same Collection of integration tests ran in the Postman Runner UI, are run from the command line, using Newman. 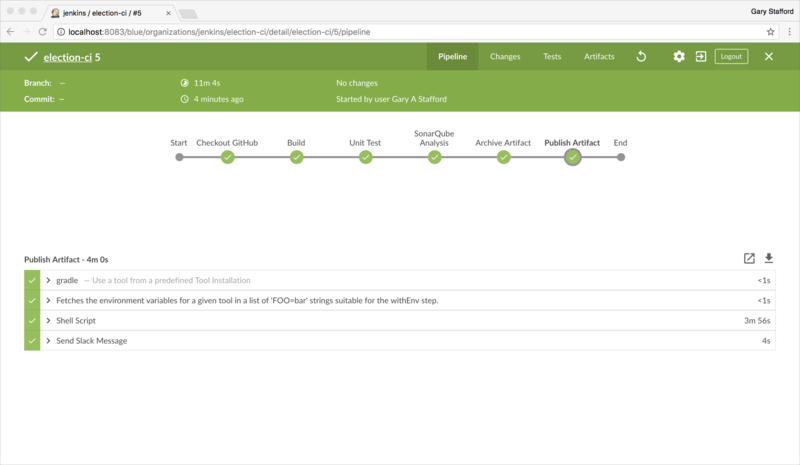 Without a doubt, Jenkins is the leading open-source CI/CD automation server. 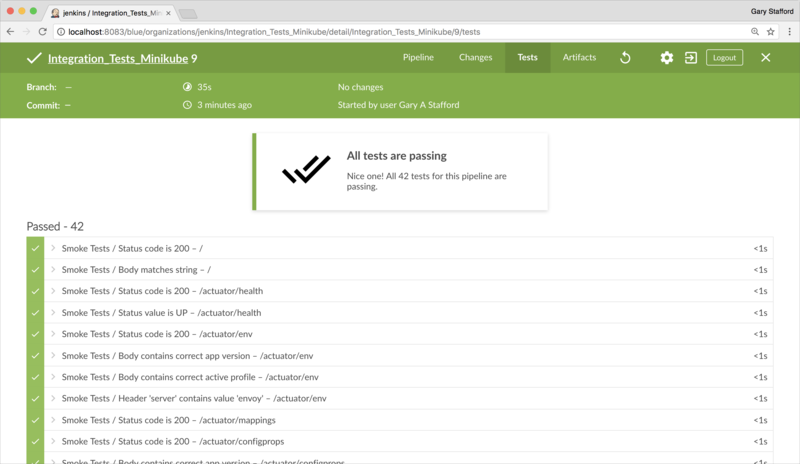 The building, testing, publishing, and deployment of microservices to Kubernetes is relatively easy with Jenkins. 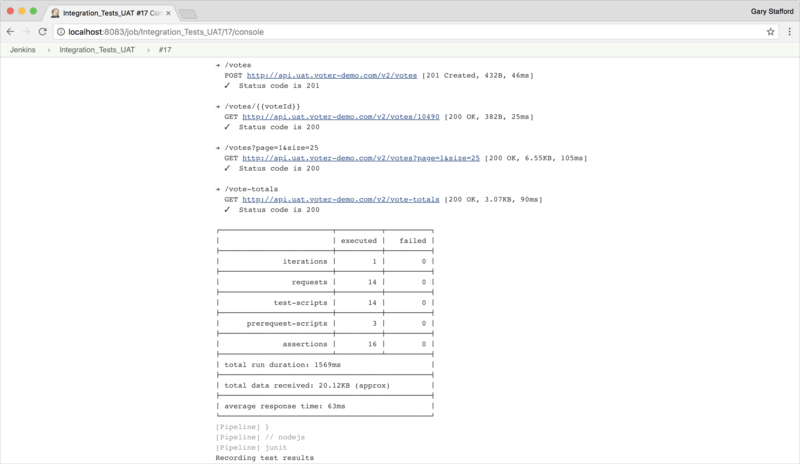 Generally, you would build, unit-test, push a new Docker image, and then deploy your application to Kubernetes using a series of CI/CD pipelines. 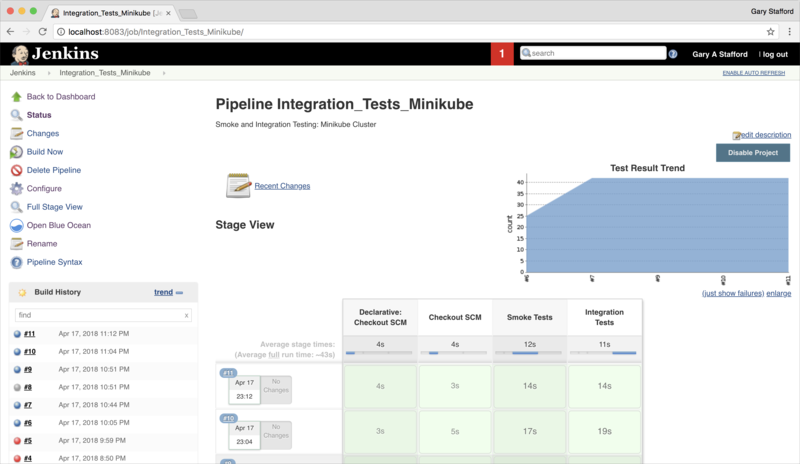 Below, we see examples of these pipelines using Jenkins Blue Ocean, starting with a continuous integration pipeline, which includes unit-testing and Static Code Analysis (SCA) with SonarQube. 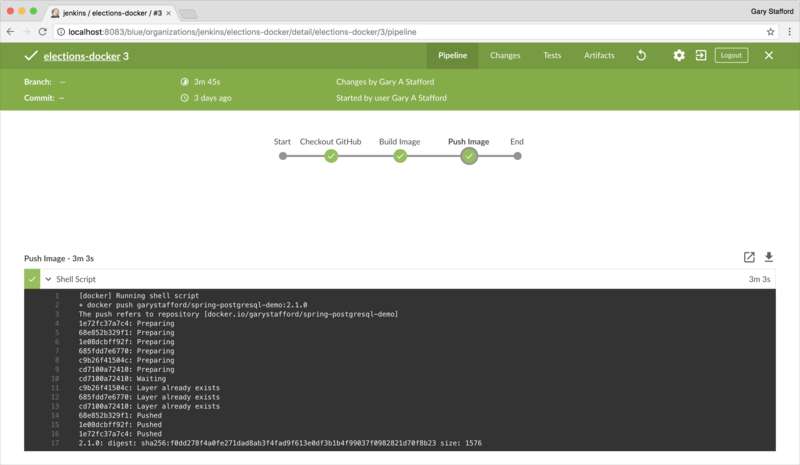 Followed by a pipeline to build the Docker Image, using the build artifact from the above pipeline, and pushes the Image to Docker Hub. The third pipeline that demonstrates building the three Kubernetes environments and deploying v1 of the Election service to the dev namespace. This pipeline is just for demonstration purposes; typically, you would separate these functions. An alternative to Jenkins for the deployment of microservices is Spinnaker, created by Netflix. 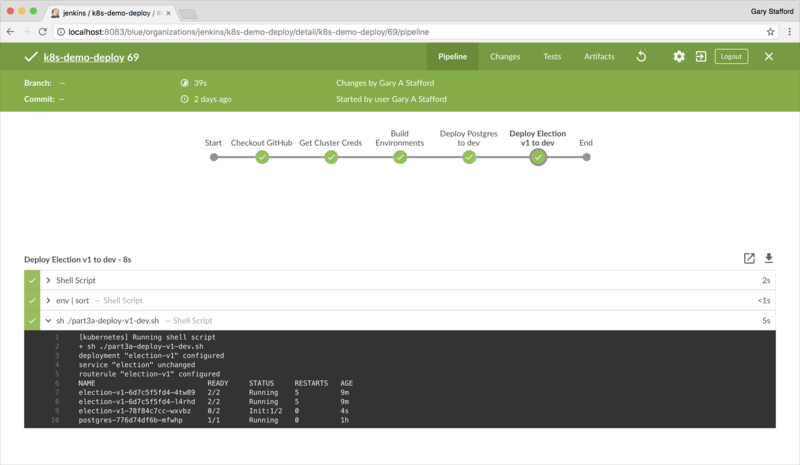 According to Netflix, ‘Spinnaker is an open source, multi-cloud continuous delivery platform for releasing software changes with high velocity and confidence.’ Spinnaker is designed to integrate easily with Jenkins, dividing responsibilities for continuous integration and delivery, with deployment. Below, Spinnaker two sample deployment pipelines, similar to Jenkins, for deploying v1 and v2 of the Election service to the non-prod GKE cluster. Below, Spinnaker has deployed v2 of the Election service to dev using a Highlander deployment strategy. Subsequently, Spinnaker has deployed v2 to test using a Red/Black deployment strategy, leaving the previously released v1 Server Group in place, in case a rollback is required. Once Spinnaker is has completed the deployment tasks, the Postman Collections of smoke and integration tests are executed by Newman, as part of another Jenkins CI/CD pipeline. 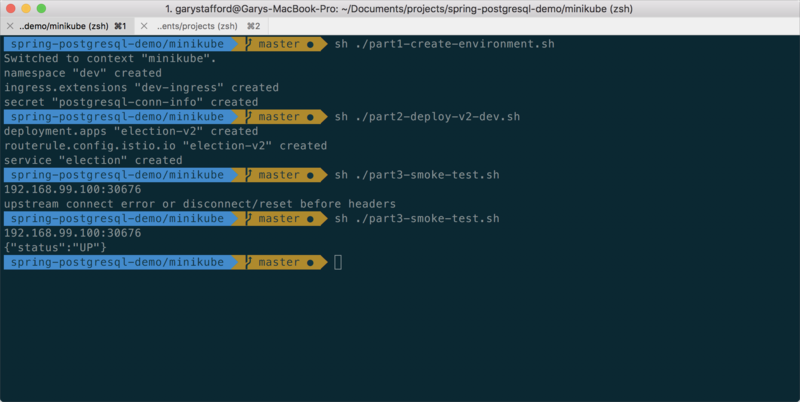 In this pipeline, a set of basic smoke tests is run first to ensure the new deployment is running properly, and then the integration tests are executed. In this simple example, we have a three-stage pipeline created from a Jenkinsfile (gist). Newman offers several options for displaying test results. For easy integration with Jenkins, Newman results can be delivered in a format that can be displayed as JUnit test reports. The JUnit test report format, XML, is a popular method of standardizing test results from different testing tools. Below is a truncated example of a test report file (gist). Translating Newman test results to JUnit reports allows the percentage of test cases successfully executed, to be tracked over multiple deployments, a universal testing metric. Below we see the JUnit Test Reports Test Result Trend graph for a series of test runs. Development environments typically have a rapid turnover of application versions. Many teams use their Development environment as a continuous integration environment, where every commit that successfully builds and passes all unit tests, is deployed. 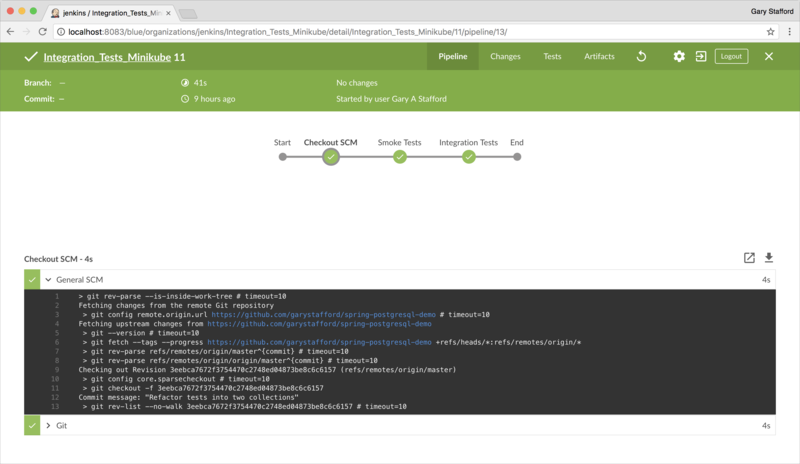 The purpose of the CI deployments is to ensure build artifacts will successfully deploy through the CI/CD pipeline, start properly, and pass a basic set of smoke tests. Other teams use the Development environments as an extension of their local Minikube environment. The Development environment will possess some or all of the required external integration points, which the Developer’s local Minikube environment may not. The goal of the Development environment is to help Developers ensure their application is functioning correctly and is ready for the Test teams to evaluate, prior to promotion to the Test environment. Some external integration points, such as external payment gateways, customer relationship management (CRM) systems, content management systems (CMS), or data analytics engines, are often stubbed-out in lower environments. Generally, third-party providers only offer a limited number of parallel non-Production integration environments. While an application may pass through several non-prod environments, testing against all external integration points will only occur in one or two of those environments. With v2 of the Election service ready for testing on GKE, we deploy it to the GKE cluster’s dev namespace using the part4a-deploy-v2-dev.sh script. We will also delete the previous v1 version of the Election service. Similar to the v1 deployment script, the v2 scripts perform a kube-inject command, which manually injects the Istio sidecar proxy alongside the Election service, into each election v2 Pod. 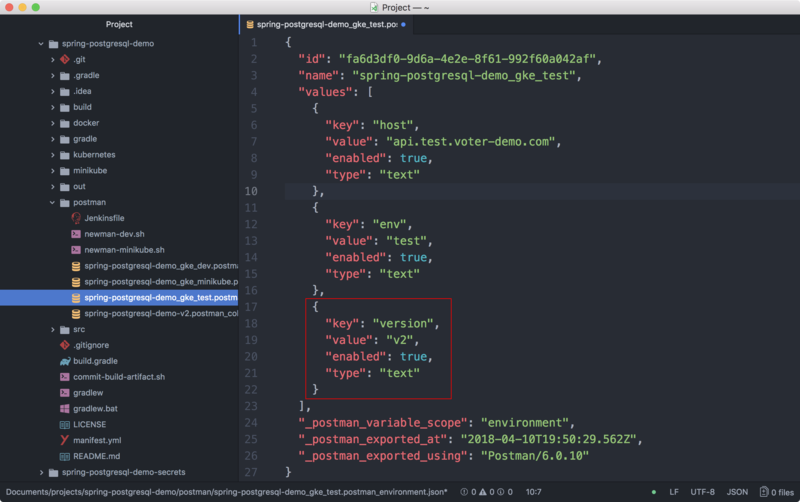 The deployment script also deploys an alternate Istio Route Rule, which routes requests to api.dev.voter-demo.com/v2/* resource of v2 of the Election service. Once deployed, we run our Postman Collection of integration tests with Newman or as part of a CI/CD pipeline. In the Development environment, we may choose to run a limited set of tests for the sake of expediency, or because not all external integration points are accessible. With local Minikube and Development environment testing complete, we promote and deploy v2 of the Election service to the Test environment, using the part4b-deploy-v2-test.sh script. In Test, we will not delete v1 of the Election service. Often, an organization will maintain a running copy of all versions of an application currently deployed to Production, in a lower environment. Let’s look at two scenarios where this is common. First, v1 of the Election service has an issue in Production, which needs to be confirmed and may require a hot-fix by the Development team. Validation of the v1 Production bug is often done in a lower environment. The second scenario for having both versions running in an environment is when v1 and v2 both need to co-exist in Production. Organizations frequently support multiple API versions. Cutting over an entire API user-base to a new API version is often completed over a series of releases, and requires careful coordination with API consumers. An essential role of integration testing should be to confirm that both versions of the Election service are functioning correctly, while simultaneously running in the same namespace. For example, we want to verify traffic is routed correctly, based on the HTTP request URL, to the correct version. Another common test scenario is database schema changes. Suppose we make what we believe are backward-compatible database changes to v2 of the Election service. We should be able to prove, through testing, that both the old and new versions function correctly against the latest version of the database schema. There are different automation strategies that could be employed to test multiple versions of an application without creating separate Collections and Environments. A simple solution would be to templatize the Environments file, and then programmatically change the Postman Environment’s version variable injected from a pipeline parameter (abridged environment file shown below). Once initial automated integration testing is complete, Test teams will typically execute additional forms of application testing if necessary, before signing off for UAT and Performance Testing to begin. With testing in the Test environments completed, we continue onto UAT. The term UAT suggest that a set of actual end-users (API consumers) of the Election service will perform their own testing. Frequently, UAT is only done for a short, fixed period of time, often with a specialized team of Testers. Issues experienced during UAT can be expensive and impact the ability to release an application to Production on-time if sign-off is delayed. After deploying v2 of the Election service to UAT, and before opening it up to the UAT team, we would naturally want to repeat the same integration testing process we conducted in the previous Test environment. We must ensure that v2 is functioning as expected before our end-users begin their testing. This is where leveraging a tool like Jenkins makes automated integration testing more manageable and repeatable. One strategy would be to duplicate our existing Development and Test pipelines, and re-target the new pipeline to call v2 of the Election service in UAT. Again, in a JUnit report format, we can examine individual results through the Jenkins Console. 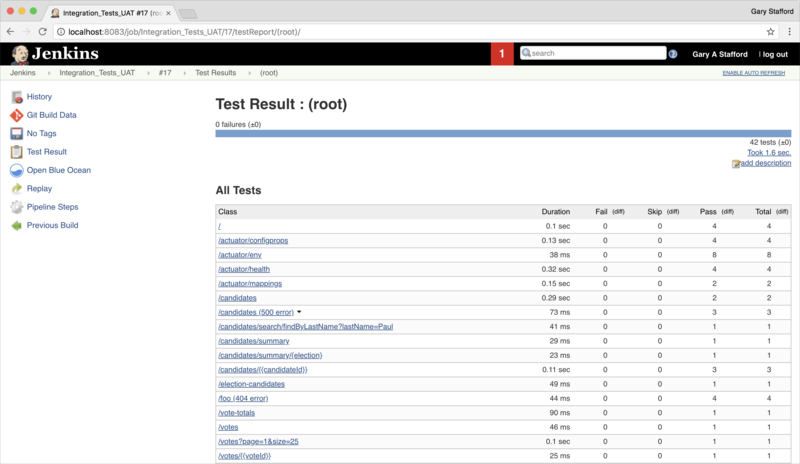 We can also examine individual results from each test run using a specific build’s Console Output. To fully evaluate the integration test results, you must look beyond just the percentage of test cases executed successfully. It makes little sense to release a new version of an application if it passes all functional tests, but significantly increases client response times, unnecessarily increases memory consumption or wastes other compute resources, or is grossly inefficient in the number of calls it makes to the database or third-party dependencies. Often times, integration testing uncovers potential performance bottlenecks that are incorporated into performance test plans. Critical intelligence about the performance of the application can only be obtained through the use of logging and metrics collection and instrumentation. 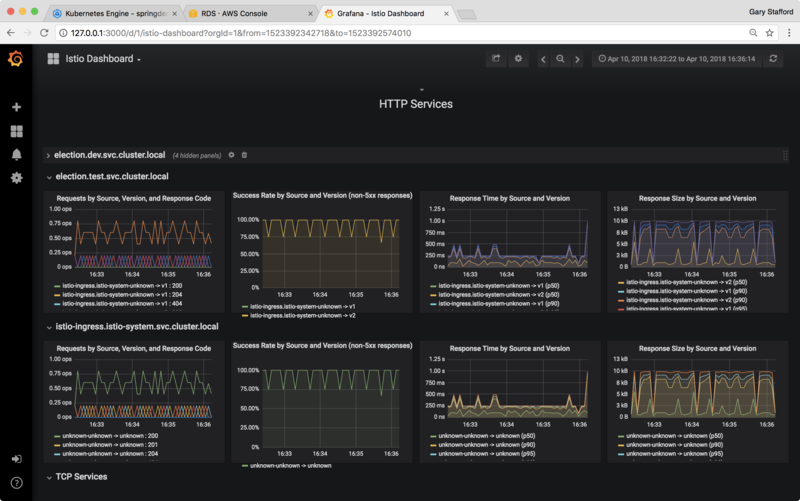 Istio provides this telemetry out-of-the-box with Zipkin, Jaeger, Service Graph, Fluentd, Prometheus, and Grafana. In the included Grafana Istio Dashboard below, we see the performance of v1 of the Election service, under test, in the Test environment. We can compare request and response payload size and timing, as well as request and response times to external integration points, such as our Amazon RDS database. We are able to observe the impact of individual test requests on the application and all its integration points. As part of integration testing, we should monitor the Amazon RDS CloudWatch metrics. 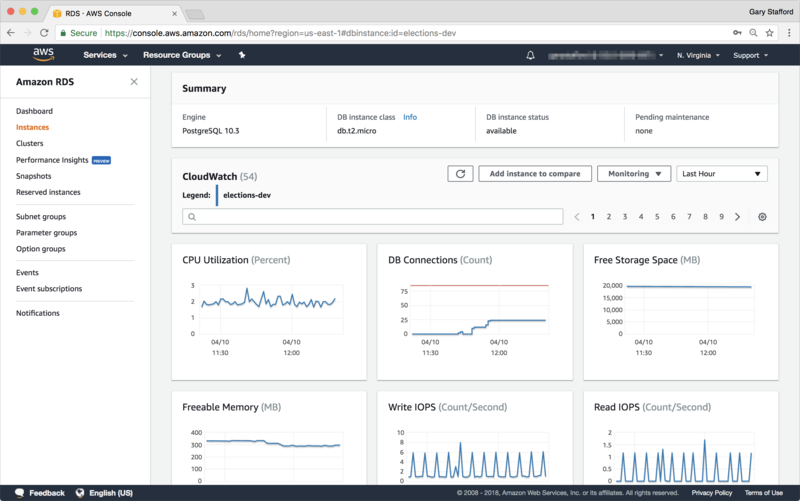 CloudWatch allows us to evaluate critical database performance metrics, such as the number of concurrent database connections, CPU utilization, read and write IOPS, Memory consumption, and disk storage requirements. A discussion of metrics starts moving us toward load and performance testing against Production service-level agreements (SLAs). Using a similar approach to integration testing, with load and performance testing, we should be able to accurately estimate the sizing requirements our new application for Production. Load and Performance Testing helps answer questions like the type and size of compute resources are required for our GKE Production cluster and for our Amazon RDS database, or how many compute nodes and number of instances (Pods) are necessary to support the expected user-load. This entry was posted on April 17, 2018, 7:01 am and is filed under Build Automation, DevOps, Enterprise Software Development, GCP, Software Development. You can follow any responses to this entry through RSS 2.0. You can leave a response, or trackback from your own site.